This is the official mission logo. Click on the image to download an encapsuled postscript file named oaxtc92.eps. The main goal of this study was to determine the atmospheric mixing ratio of hydrochlorofluorocarbon 22 (HCFC-22) and its partial pressure in surface waters of the West Pacific Ocean to assess the possible existence of an oceanic sink for this compound. The ship started out of Long Beach, CA, and reached Dutch Harbor, AK, one week later. The cruise continued to a point offshore of Kamchatka, Russia, Kwajalein Atoll, Marshall Islands, and finally ended in Noumea, New Caledonia, 12 weeks after it began. CFC-11 (CCl3F), CFC-12 (CCl2F2), CFC-113 (CCl2FCClF2), methyl chloroform (CH3CCl3), carbon tetrachloride (CCl4), nitrous oxide (N2O) and HCFC-22 (CHClF2) were measured in the air and surface waters of the Pacific Ocean between 55°N and 22°S during the late summer and early fall of 1992. Atmospheric measurements of all gases agreed well with results from NOAA fixed stations at similar latitudes. CFC-11, CFC-12, and CFC-113, which have long atmospheric lifetimes and are essentially inert in seawater, responded mainly to physical processes in the air and water. The first two gases were supersaturated by 2-6% at higher, northern latitudes, reflecting the effects of radiative warming. Their saturation anomalies declined southward through the tropics and ultimately became slightly negative in the southern hemisphere. HCFC-22 showed signs of small losses in the tropics and subtropics, a sink that may account for 2% of the losses of this gas from the atmosphere. CH3CCl3 showed a similar pattern, with only a tropical sink. This is consistent with hydrolysis and, together with data from an earlier expedition, implies that about 6% of atmospheric CH3CCl3 is lost to the ocean. The net saturation anomaly for CCl3 was virtually negative everywhere and only slightly dependent upon latitude. This would be expected for a sink that was not particularly temperature dependent and it is consistent with evidence from deepwater profiles that indicate a sink at depth. Fluxes calculated from CCl4 saturation anomalies indicate that 15-35% of atmospheric CCl4 is lost to the ocean. From left to right: Tom, John Wayne, Jürgen, and Jim (just arriving at John Wayne Airport in Long Beach, CA) . The John V. Vickers is about 67 m long and fast. Formerly a tuna-fish boat, the Vickers was converted to a scientific vessel in the late 80s. It served several major missions (WOCE, TOGA/COARE) carrying a crew of about 14 with a capacity of 24 scientists, before it was retired in 1993. 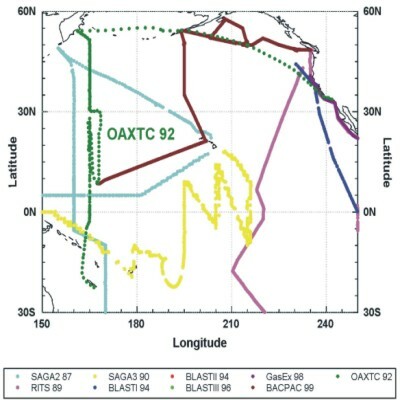 OAXTC 92 is shown in dark green through the Pacific Ocean, out of Long Beach, California into Noumea, New Caledonia. NOAA Technical Memorandum ERL CMDL-9, July 1995. This report is available from the authors or can be viewed online HERE (large document). Data are available on our anonymous FTP account ftp.cmdl.noaa.gov, subdir /hats/ocean/oaxtc_92.